The term “E-Health” in our readings means also developments, besides the smart applications running on mobile devices. This applications might ease and speed-up the medical consultation and treatment. Furthermore, we count here the quality control solutions, which improve and ensure the level of medical services. We would like to develop some new applications, which will become useful solutions not only in Hungary and Central and Eastern Europe, but also in Western part of Europe, especially focusing here on diagnostic medical fields. 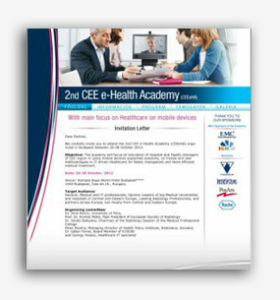 In 2012 we have successfully organized the 2nd CEE eHealth Academy, to be continued.